Jazz! My Most Favorite Feline Friend. Jazz came to the Cat Palace USA family in December 2007 from the Human Society of Frederick. 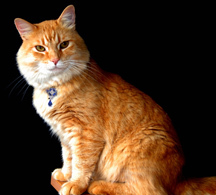 They had no prior history about him, however, he has turn out to be the most lovable cat in the entire family. He just loves to sit on the nightstand every evening and play with his salt-water fishes. The fish come over to the glass and just look back. It is very laughable and funny to watch the interaction against predator and prey! You will find Jazz many places on the Cat Palace USA web site. He just adores being a famous cat around the world. One can tell this with his smug smile under the cat jewelry section and the shopping cart. Let us know if you find him somewhere else. Our Cat Teattle and Jazz have become great pals. Wherever you find one, you’ll find the other. They both like to roam the property together spending time sunbathing, playing with the field mice and chasing each other around, just like Michael did with Teattle before he went to heaven. It should be noted that Teattle is Michael sister who were the best of friends.